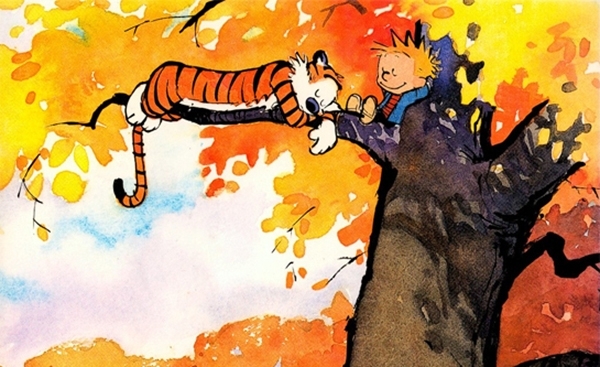 ‘Calvin and Hobbes’ was a daily cartoon printed in the newspapers globally. It is about a four-year-old kid that has a stuffed tiger. But in his fantasy the tiger is actually alive. This setting gave Bill Watterson the possibility to express much more than you would expect. The cartoon ran only for 10 years, but it was immensely popular. Although, it was popular I only heard of it a few times. My parents were not subscribed to a newspaper that had Calvin and Hobbes in it. And at that time cartoons didn’t really interest me. This changed at later age, when I started to do some cartooning myself. It was at that time that I rediscovered Calvin and Hobbes. With some more knowledge about the difficulties of cartooning I straight-away saw the quality of the Calvin and Hobbes cartoons. I noticed how Bill Watterson could change the point of view between the different frames in a cartoon without making it appear weird. Good examples can be found below. As you can see Bill Watterson shows Calvin and Hobbes on the back during a walk. Or switches position between the two characters. Beginner courses about cartooning tell you not to do this, because it will look like the persons are swapped around. Small additions, like Calvin’s mother working in the garden make the cartoon so full of life. It is not necessary for the story, but it adds so much. Simply the positioning of Calvin in the cartoon makes him look smaller compared to his parents. Look at the head in the second frame. Bill’s drawings of nature are also very strong. He can give you the feeling that it happens in a forestry area during autumn. He can do it with just a few well-placed lines. I think it is wonderful. The images below show what I mean. Drawing cartoons for the newspapers limited the possibilities for Bill Watterson. Especially in the beginning he had to follow the strict guidelines about framing. In a later stadium he was able to get more freedom on the Sunday cartoons, which are one-page stories. The Sunday cartoon are also colored. I don’t particularly like the coloring of the Sunday cartoons, but the images of the book covers are beautiful. It is all done with water color and I know from own experience how difficult that is. Unlike normal paint a water color painting cannot be corrected anymore, or it is very difficult. When you look at the image at the top of the article, you can see all the different colors and how leaves are painted. The atmosphere is very positive and makes you wish to be there. A few years ago, I bought the ‘Complete Calvin and Hobbes’ collection, which contains all the cartoons and book covers. I really enjoy reading these cartoons every now and then. The other book I bought is an exhibition guide for the Exploring Calvin and Hobbes exhibition at the Billy Ireland Cartoon Library and it contains a selection of cartoons, but most importantly it contains an interview with Bill Watterson, in which he explains how he got into cartooning and why he stopped. These are the only two Calvin and Hobbes books you need in your collection. If you don’t mind making me a bit of money as an Amazon affiliate, you can use the links on this page to purchase the books.